INDIANAPOLIS, June 12, 2014 – Logan Dooley of Lake Forest, Calif./World Elite Gymnastics, and Steven Gluckstein of Atlantic Highlands, N.J./Elite Trampoline Academy, and Charlotte Drury of Laguna Niguel, Calif./World Elite Gymnastics, and Hayley Butcher of Saint John, Ind./Midwest Training and Ice Center, won the senior elite men’s and women’s synchronized trampoline titles, respectively, at the 2014 U.S. Elite Challenge at the Spokane (Wash.) Convention Center. 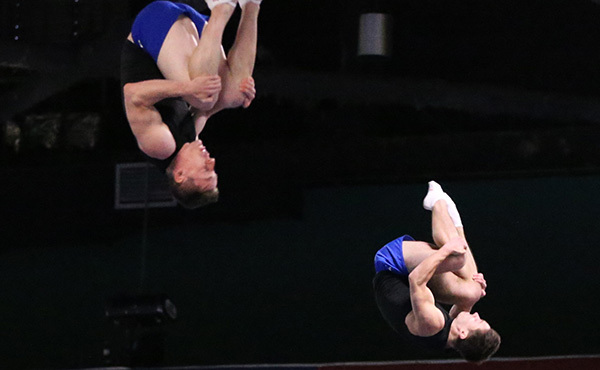 Elite competition continues today at 5 p.m. PT with the qualification rounds for men’s and women’s trampoline, tumbling and double mini-trampoline. Dooley and Gluckstein won the title with a 134.200. It was Dooley’s seventh-consecutive Elite Challenge synchro title. In second place were Jeffrey Gluckstein of Atlantic Highlands, N.J./Elite Trampoline Academy, and Alexi Shostack of Lafayette, La./Trampoline and Tumbling Express, followed by Hunter Brewster of Lafayette, La./Trampoline and Tumbling Express, and Neil Gulati of Irvine, Calif./World Elite Gymnastics, in third. For the women Drury and Butcher took top honors with a score of 94.000. The silver medal went to Deanna Parris of Burtonsville, Md./Fairland Gymnastics, and Ivanna Antezana, Silver Spring, Md./Fairland Gymnastics, (74.300). The junior men’s synchro champions were Cody Gesuelli, Middletown, N.J./Elite Trampoline Academy, and Colin Duda, Atlantic Highlands, N.J./Elite Trampoline Academy, and Ginger Hansen, Holmdel, N.J./Elite Trampoline Academy, and Courtney Walsh, Red Bank, N.J./Elite Trampoline Academy, were the women’s titlist. 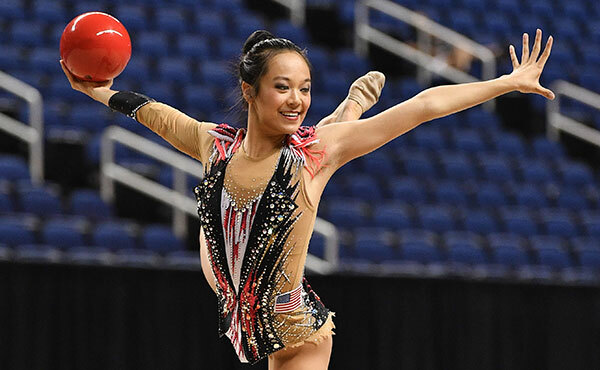 In addition to the junior and senior elite levels, the U.S. Elite Challenge also includes athletes competing in Level 10 and Youth Elite and Open Elite. The U.S. representatives for trampoline for the Youth Olympic Games are expected to be determined following the U.S. Elite Challenge, and athletes are also vying for spots to the selection camp this fall for the 2014 World Championships and World Age Group Competition, scheduled for Daytona Beach, Fla., in November. 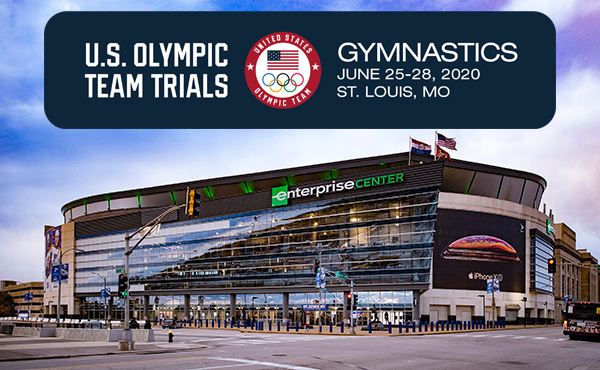 Additionally, the Levels 5-7 National Trampoline and Tumbling Championships is being held in conjunction with the U.S. Elite Challenge. During the three days, approximately 900 athletes are expected to compete. 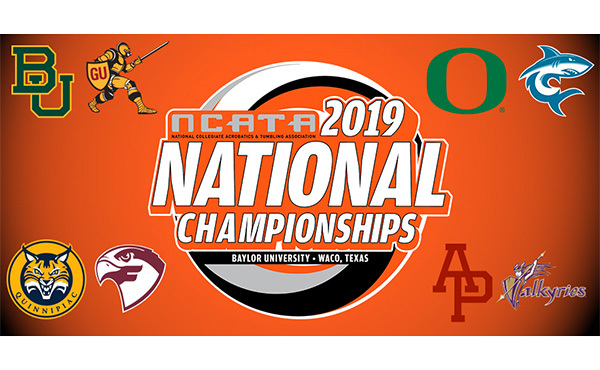 Elite finals in each of the three different events will be held Saturday, June 14, at beginning at 6 p.m. All times are local. Available at the door, tickets are $40 for all-session tickets or $15 a day. 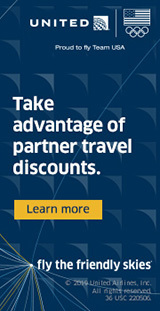 For a complete schedule, click here. 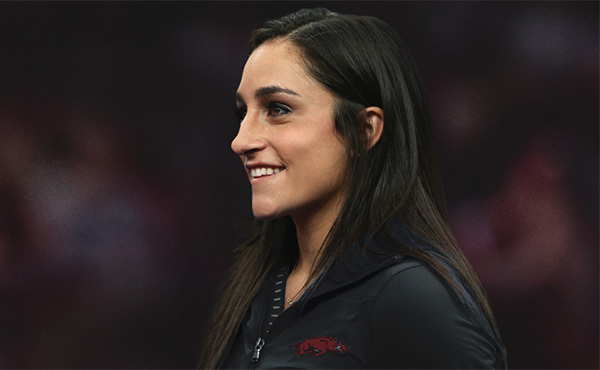 The Spokane Sports Commission worked with USA Gymnastics to bring the event to Spokane and will assist with organizing and staging the competition. Spokane Gymnastics will also be involved as part of the local organizing committee. 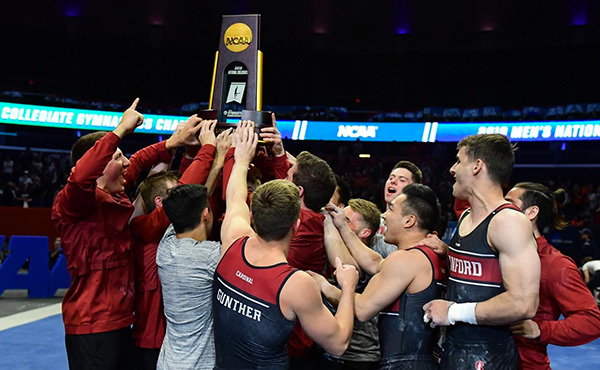 Trampoline events involve athletes using trampolines that can propel them up to 30 feet in the air, during which they can perform double and triple twisting somersaults. Tumbling utilizes elevated rod-floor runways that enable athletes to jump at heights more than 10 feet and execute a variety of acrobatic maneuvers. For the double-mini competition, the athlete makes a short run, leaps onto a small two-level trampoline, performs an aerial maneuver and dismounts onto a landing mat. Synchronized trampoline demands the same athletic skill as individual trampoline, while adding the element of precision timing. Using two trampolines, two athletes perform identical 10-skill routines at the same time. Trampoline was added to the Olympic Games in 2000, and at the 2012 Olympic Games in London, the USA had its first athlete in history advance to the finals.